Hello lovelies and Happy May! Have an MAGICAL May and thank you so much for spreading a little kindness. Hello lovelies and Happy Easter to all who celebrate it on this first day of April! Have an AMAZING April and thank you so much for spreading a little kindness. Hello lovelies and a warm welcome March! I hope you had a Fabulous February filled with love+kindness. I’m still struggling with a CFS flare up, so will keep this month’s post short+sweet. Hello lovelies and welcome February! I hope you had a joy-filled January. I find it quite a tough month after all the busyness and excitement of the festive season. It’s pretty much guaranteed that I have a CFS symptom flare-up and am grateful I can cosy up and hibernate in order to rest, recuperate and recharge. I’m so thankful for the growing longer hours of daylight! I’m definitely not a winter girl, and am ready to start seeing signs of spring. I’ll be keeping a beady eye out for snowdrops, daffodils and crocuses over the next few weeks! 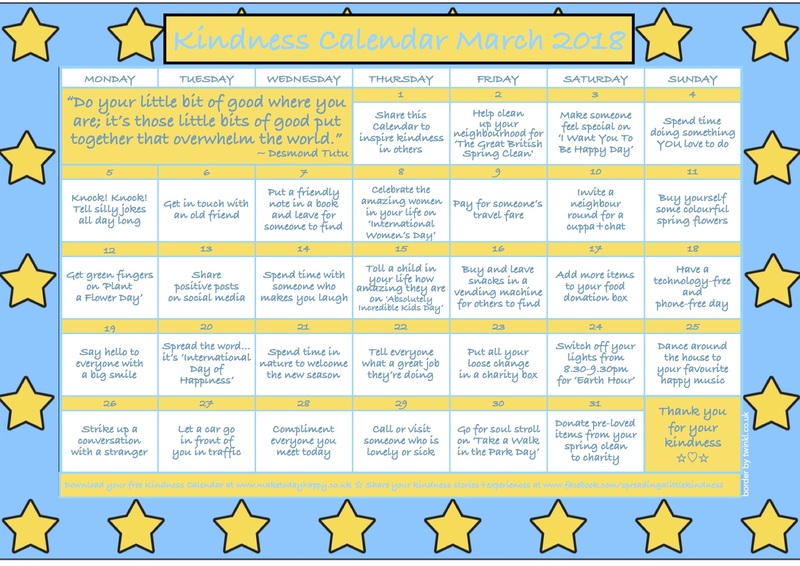 Have a fun+fabulous February; it’s Random Acts of Kindness Week starting on the 11th, culminating in Random Acts of Kindness Day on Saturday 17th February – so the perfect opportunity to spread the word and go kindness crazy!! And let’s not forget to be kind to ourselves too, we are definitely worth it! But even if every one of us manages to do just one kindness act on one day this month - imagine how amazing that would be! Every single extra act of kindness counts, and together we are making the world a kinder place. So let’s get as many people as we can involved. 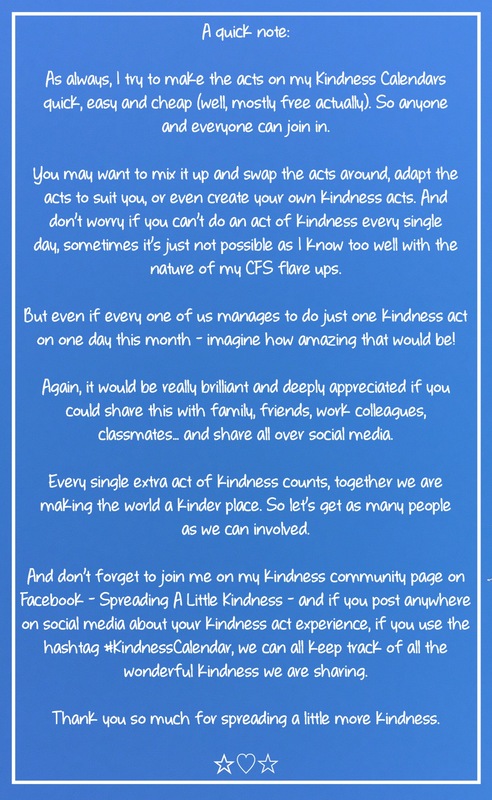 And don’t forget to join me on my kindness community page on Facebook, and if you post about your kindness act, please use the hashtag #KindnessCalendar so we can all keep track of all the wonderful kindness we are sharing. Hello lovelies and wishing you a Joyful January and an AMAZING 2018. I hope you had a Delightful December, filled with moments of love, laughter and goodwill. And for those who joined in with my Kindness Advent Calendar, I hope you had oodles of fun – I’d love to hear about your kindness experiences. Have a joy-filled January, and let’s remember to be kinder to ourselves as well, we are definitely worth it! Speaking of which, I’m having a break from social media in January, so I’ll see you in February. I’ve received quite a few requests from people who work with children and want to share my Kindness Advent Calendar for KIDS – but aren’t allowed to feature it because of the use of the words ‘Advent’ and ‘Christmas’. Kindness Advent Calendar 2017 – Coming Soon! Please subscribe if you’d like it delivered straight into your inbox. Author HelenPosted on 11th November 2017 11th November 2017 Categories Kindness CalendarsTags Kindness Advent Calendar, Kindness Calendar6 Comments on Kindness Advent Calendar 2017 – Coming Soon! I hope October overflowed with kindness for you, and you are ready to greet this brand new month and all that it brings. The name derives from the latin ‘novem’ which means nine, as November was the ninth month of the year in the ancient Roman calendar. November is the only month used to represent a letter in the phonetic alphabet. In 1863, US President Abraham Lincoln, declared the last Thursday of November to be a National Day of Thanksgiving. This month has two birthstones: Topaz comes in many colours, but it is the orange-yellow topaz that is the traditional birthstone for November. Topaz is a symbol of friendship. Citrine is also a November birthstone. Named after the French word for ‘lemon’, citrine is also yellow-orange in colour and is known to awaken imagination and creativity. November’s astrological signs are Scorpio, from 23rd October to 21st November, and Sagittarius which runs from 22nd November to 21st December. If you were born in November you may share a birthday with: 2nd Marie Antoinette; 5th Vivien Leigh; 7th Marie Curie; 11th Leonardo DiCaprio; 12th Grace Kelly; 14th Claude Monet; 17th Martin Scorsese; 18th Mickey Mouse’; 22nd George Eliot and Billie Jean King; 26th Tina Turner; 27th Jimi Hendrix; 30th Mark Twain and Sir Winston Churchill. Wishing you a nourishing November, and let’s remember to be kinder to ourselves as well as to others… we are definitely worth it! I hope you had a Sensational September, sparkling with kindness. My month was pretty much a washout due to a flare up of CFS symptoms, but after a month of almost complete rest, I’m feeling a little more recharged and hopeful for this brand new month ahead. I’m such a sunshine summer girl, but seeing all the stunning colours of autumn softens the blow a little of summer ending, and I couldn’t help but choose a pretty autumnal leaf design for this month’s kindness calendar. October received it’s name from the Latin numeral ‘octo’ which means number eight, as in the Roman calendar it was the eighth month. The Anglo-Saxons named it Winterfylleth, which means ‘fullness of winter’ because it had the first full moon of the winter season. This month’s gemstones are the semi-precious stone Opal, known as the Queen of Gems as it encompasses the colours of all the other gems, and Tourmaline which comes in a rainbow of colours – my favourite is Paraiba Tourmaline, a relatively new discovery with striking ocean-like blues and greens. October’s flower is the Calendula, the common marigold, and symbolises comfort, gratitude, grace and good luck. It’s known for its medicinal and healing properties. Oktoberfest, which features live music, games, amusement rides, beer tents, and a traditional Bavarian fair, is a 16 day festival which starts late September and ends early October. It began in 1810 when Prince Ludwig of Bavaria invited his people to celebrate his marriage to Princess Therese of Saxony-Hildburghausen. Believe it or not, the largest beer drinking festival in the world was originally alcohol-free! Halloween began as a Celtic pagan festival of Samhain, which means ‘the end of summer’ . It was part of the ancient Celtic religion in Britain and other parts of Europe. On All Hallows’ Eve – the night before All Saints’ Day on 1st November – the Celts had a big party, which was all about scaring away the ghosts and spirits. The holiday became popular in the United States when Irish immigrants arrived during the 19th century. One final note: as my thoughts start turning towards this year’s Kindness Advent Calendar, I’d love to hear your favourite kindness acts. Which kindness acts would you like to see on this year’s Advent Calendar? Let me know and I’ll do my best to include them. I’m also thinking of including an optional donation of £1/$1 to a charity which promotes kindness – I’d love to hear your thoughts. Let’s have a fun month, and let’s remember to be kinder to ourselves as well, we are definitely worth it! Have an OUTSTANDING OCTOBER and thank you so much for spreading a little more kindness.